The pre-history of Sri Lanka has its beginnings around 10,000 BC with two distinct phases, pre-history and proto-history. The first phase could probably have lasted till about 1000 BC and the second may have ended, in some part of the island at least with the introduction of metal, three or four centuries later. The stone making technology of the early cultures, such as Mesolithic, appears to continue into pre-historic times. The Neolithic or pottery phase saw the technique of producing stone implements by abrasion and the solid core drill. The archaeological evidence on the pre-history of Sri Lanka, is still too much a rudimentary form to attempt even bare outlines of the beginnings of human society in the island. The physical characteristics of dwellers were predominantly Austroloid with Neandethaloid overtones. The Vedda aboriginal of Sri Lanka physically possesses a close resemblance to the pre-historic descendants. The submergence of these pre-historical dwellers and its physical and cultural affinities came under pressure with the advent of early colonisers from India. They were gradually subjected to extinction and the settlers called Yaksha and Naga emerged; about whom much has been left, with beliefs and perceptions of the ancient literati. At this time Sri Lanka is also much connected with the stories of the Indian epic Ramayana. Mahawamsa, the great chronicle is the Pali record of the early history of this land. It was written at Anuradhapura by a Buddhist monk named Mahanama and its settlers some fourteen hundred years ago. Mahawamsa shows the earliest point of Sri Lanka history as the arrival of Vijaya with his seven hundred men. 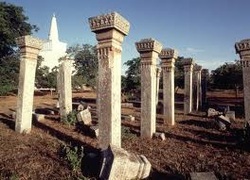 From the fateful conjunction Vijaya and his men landed at Thambapanni, which is believed to be the district of Chilaw. From Vijaya's arrival in 6th century BC, down to Sri Wickrema Rajasinghe, 295 kings reigned over the whole or parts of Sri Lanka. Then after activating the 1815 Kandyan Convention, the Sinhala chiefs signed over the Kandyan kingdom to George III of Great Britain. The monarchy, which began twenty-three centuries before, continued till the appointment of the President of the Republic of Sri Lanka in 1972. The next great event after the arrival of Vijaya is the arrival of Mahinda, which in turn paved the way for the advent of Buddhism to Sri Lanka. The Mahawamsa introduces Mahinda Thera as the son of the Great Emperor Asoka, who few years later accompanied his sister Theri Sangamitta with the 'Sri Maha Bodhi', the holy Bo tree that gave shelter to Buddha to attain Nibbana. Appearing on top of Mihintale, Sri Lanka, on a Poson Poya Day, when King Devanampiyatissa was hunting, the Arahat Mahinda preached to the king, the message of Universal Compassion. King Devanampiyatissa, his Queen and in time their people were converted. The Bo tree was planted at Anuradhapura, Sr Lanka, where it still grows as the oldest tree with a recorded history in the world. Sangamitta brought over the Buddhist nuns and the Bhikkuni system to Sri Lanka. With the dawn of the second century BC, adventurers from across the Palk Strait had begun to settle down in the northern coast of Sri Lanka. 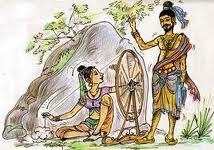 One such intruder called Elara, became supreme in almost whole of the North and reigned from Anuradhapura. He was later challenged by the ruler Gemunu, son of King Kavantissa. Later this independent ruler, Gemunu of the South met in combat with Elara and the latter was killed. For the first time a single kingdom for the island of Sri Lanka arose. Dutugemunu's reign 161-137 BC saw the culmination of Buddhism in Sri Lanka. Monks were disciplined in Vinaya and were well versed in Tripitaka. Dutugemunu contributed immensely for the religion of Buddhism. With the death of Dutugemunu, Buddha's prophecy had come to pass. 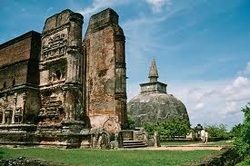 The Anuradhapura Kingdom, which was built by Dutugemunu, lasted one thousand and five hundred years. In the second half of the first century, at Aluvihare, near Matale, in the region of Valagamba, the Buddha-world, and the Pali canon was committed to writing. Despite the intrusions and clashes of South Indian Chola, Pandyan and Pallava, there prevailed stability in the continuity of the Anuradhapura civilisation. Despite strong Mahayanist and Hindu influences the Theravada retained its integrity. Due to the strong diplomatic relations among the countries like Rome and China, in first century AD. Fa-Hsien visited Sri Lanka. And in seventh century, Hisuen T'sang regretted his failure of his attempt to reach Sri Lanka. Sigiriya is a rock-fort built by fugitive king Kasyapa I (473-91BC), the eldest son of King Datusena (455-73 BC). He built his palace on the summit of this enormous 600-ft high rock, as legend says, like another Alakamanda, the celestial abode of Kuvera, the god of wealth. The King had made a huge 'couchant lion' through whose throat one ascents to the summit. Sigiriya has been named after this monument. It is a complex of buildings part royal palace with superbly designed ornamental garden-parts fortified town, which together constitute a magnificent and unique architectural tour de force. Sigiriya, today is famous for its twenty-one exquisite frescoes in a rock pocket some 40 feet above the access pathway depicting Lighting Princesses attended by Cloud Maidens. These are the earliest surviving specimens of the pictorial art of Sri Lanka. The mirror wall of Sigiriya contains interesting examples of a lively and sensitive folk poetry in verses inscribed on the wall by visitors to the place in eighth and ninth centuries numbering approximately 800. The most remarkable aspect of the whole complex, is its mathematical planning and entire design concept. The layout of the garden complex extends outward, co-ordinating at the centre of the palace complex on the summit of the rock. Recently, Sigiriya has been declared as a world heritage monument. The Sri Lanka civilisation was mainly depending on agriculture. To irrigate these rice fields the early rulers collected water in man-made reservoirs in Anuradhapura and Polonnaruwa. Then, kings of Sri Lanka discovered a new method to collect water during both the monsoons. They chose great rivers flowing from the central hills, throughout both the monsoons and blocked these rivers by dams to produce irrigation water. This was a great impact on the development of agriculture, mainly on rice cultivation. Mahinda V was the last king to reign at Anuradhapura. The history of Sri Lanka illustrates the Chola intrusion; in 1017 AD, the North became a province of the Chola Empire. In 1017 AD the Cholas were expelled by Vijayababu I and he continued to remain in Polonnaruwa. The dusk of the Anuradhapura kingdom did not lead to the downfall of Buddhism within the country. which is a stone platform with daintily carved pillars rising in the form of opening lotus buds are of incredible beauty. Gal Vihare with splendid Buddha statues takes us back to the memory of the most impresses that have faded. 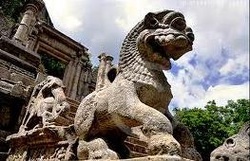 Polonnaruwa developed its commercial ties with China having Gokanna (Trincomalee) as the prominent commercial port. Dambadeniya was a seat of Government of the Sinhala Kings, for about 63 years commencing from 1220 AD. The shifting of the capital of Sri Lanka was also a result of a further invasion led by Chandrabanu of Tambralingam, a pretty kingdom of the Malay Peninsula, which had established itself as an independent state in the last days of Sri Vijaya empire in the middle of the 13th century. Parakramabahu's (1236-1270 AD) forces defeated Chandrabanu and restored the sovereignty of the country. The period of rule form Dambadeniya as the capital was not long enough to make a considerable impact on art and architecture. His literary achievements of the scholars of Dambadeniya are remarkable. King Parakramabahu II himself was a scholar in his own right who wrote Kavusilumina, the Crest Gem of the Sinhala poetry, based on the Kusa Jathaka story. Poojawaliya and Saddharma Ratanavaliya are two other literary works produced during the Dambadeniya time. From Dambadeniya the capital again shifted to neighbouring Yapahuwa, which is a picturesque rock fortress, 300 feet high abounded with old rock shelters where the Buddhist anchorites were said to have been living. Yapahuwa was first occupied by the Chieftain Subha to defend South Indian forces penetrating southwards. 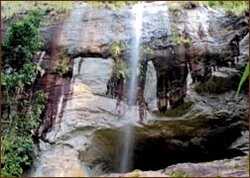 Thus the rock was named after Subha; Subhpabbata in Pali and Yapahuwa in Sinhala. Yapahuwa was used as the residence of King Vijayabahu IV [1270-1272 AD] and few of his successors. A shrine was also built adjacent to the palace to safeguard the Sacred Tooth Relic. King Buwanekabahu [1272-1284 AD] of Yapahuwa attempted to establish diplomatic relations with Egypt by sending an embassy to the court of the Sultan there. Marco Polo mentions that a mission from the Chinese Emperor also arrived in Sri Lanka in 1284 AD. Another South Indian ruler Arya Chakravarthi stormed the citadel of Yapahuwa paving the way to shift the capital to another site. The citadel of Kotte was the administrative centre of the Sinhala Kings from fourteenth century. Kotte was a fortified city, which was built by Chieftain Alagakkonara and named as Jayawardenepura. 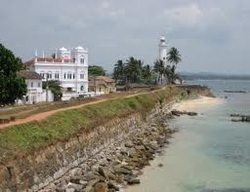 The establishment of the city closed to Kolom Tota, the port of Colombo was a farsighted decision of his to convert the country's economy more towards trade from agriculture. Kotte, however, glorified, by King Parakramabahu IV (1412-1467AD) who made immense contribution to the development of Sinhala literature. Several seats of learning emerged during his regime, including Vijayaba Pirvena of Totagamuwa, Padmavathi Pirivena of Keragala and Sunethra Devi Pirivena of Pepiliyana. Scholars like Totagamuwe Rahula, Vidagama Maitreya engaged in literary activities in the reign of King Parakramabahu VI (1411-1466 AD) of Kotte. A Considerable number of archaeological sites have been discovered and restored in Kotte. Kotte was renamed as Sri Jayawardenepura when it was declared as the official capital of Sri Lanka in 1982. The Sinhala kings commenced shifting their administrative capital from low land to central mountains, a region, which never in the past was well developed or highly populated. This region however proved to be an excellent refuge for defeated causes and a bridgehead for resistance movements. For this reason, a kingdom was set up at Gampola, literally known as Gangasiripura on the river Mahaweli in the fourteenth century. With the advent of the capital in Gampola a curious system of sub-kings or co-rulers emerged. When one king was at Gampola his brother ruled at Dedigama, less than thirty miles away on aerial route. The power of the kingdom of Gampola further reduced with the rise of influential chief ministers like Alagakkonara who became more powerful than the king. 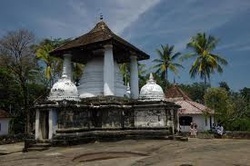 Gampola is surrounded by many important Buddhist temples where one could see more veneration of Mahayana deities and worship of Vedic and post-Vedic Hindu deities. This tradition firmly was established as a part of religious practice of Sri Lankan Buddhism since the period of the kingdom of Gampola. 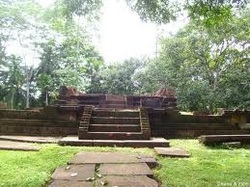 The centres, of this nature constructed at Alutnuwara to venerate god Upulwan who became the national god of the Sihhalese. Similarly, Saman, Vibhisana and Skanda images were installed at Gadaladeniya and Lankatilaka as attendants of the Buddha. The woodcarvings at Embekke Devalaya can also never be overlooked in any description of the kingdom of Gampola. Sitavaka was selected as the centre of administration by sub-ruler Mayadunne (1521-1581 AD) aiming at control over the pre-partition of the Kotte kingdom and a buffer against the emerging Portugese power in Colombo. Subsequently, Mayadunne's son Rajasingha I (1518-1593 AD), who was a strong military ruler became an implacable enemy of the Portugese with reputation as a great warrior. He succeeded to the throne in 1581 AD. 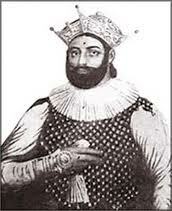 Between 1587 and 1588 Sitavaka's power reached at its zenith. Rajasingha I died in 1593 and the power of Sitavaka declined beyond recovery. The name Sitavaka is connected with Princess Sita of the epic Ramayana. The legend also includes that the name of Sitavaka implies the bend of the river Kelani. Among the ruins of Sitavaka the site of a royal palace and of subsequent Portuguese and Dutch forts are of importance. King Rajasingha I became a renegade to Hinduism from Buddhism and constructed the Hindu temple known as Berendi Kovila ruins of which exists even today. It was still under construction at the time of his death. The outstanding ruins of Berendi Kovila contain stones beautifully dressed by master craftsmen of the time. The name 'Colombo' derives from the Sinhala noun Kolom Tota that means 'sea port'. The city of Colombo has been the centre of colonial administration in the island. Since independence in 1948, it became the capital of Ceylon and subsequently of Sri Lanka. The Portuguese settled at the beginning of sixteenth century succeeded by the Dutch in seventeenth century and followed by the British in nineteenth century. 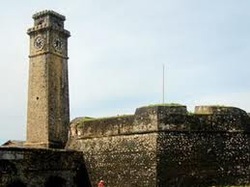 The Dutch demolished the Portuguese fortifications and constructed their own fort, which was also demolished in the last century by the British in order to expand the area of the city. The central business district of the city expanded in three stages; firstly the Fort, secondly, Pettah and thirdly, the New Bazaar. As the population increases the residents moved to more convenient outskirts. The harbour was the main port of call for European vessels faring between South Africa and Australia and as a result, a number of vessels calling over at the harbour, rapidly increased. Now it is one of the biggest container transhipment centres in Asia. Colombo is now gradually developing its facilities on par with other similar modern cities in Asia. It, however, retains its old-world's charm of its own. It is a multi ethnic and multi cultural city awaiting tremendous economic boost in the millennium. The Dutch era commences with the ousting of the Portuguese from Galle in 1640. After a series of heavy fighting the Dutch were able to gain control over most parts of the Maritime Provinces of the island. The Dutch administration being a part of a trading organisation attempted as much as possible to avoid confrontations and focused its attention to maintain a good and peaceful relationship with the kingdom of Kandy, in order to make maximum profit out of trade in Sri Lanka. Their legacy is yet to be traced physically in the coastal regions and many other facets of daily life and culture in Sri Lankan society. King Kirti Sri Rajasingha had contributed much towards the revival of Buddhism and Sinhala culture. As part of their movement, the Higher Ordination to the Buddhist called Upasampada was brought from Siam with the help of the Dutch. The result of this existed until the Dutch left Sri Lanka in 1796. Kandy is the last seat of government of the Sri Lankan kings with less antiquity than previous capitals such as Anuradhapura and Polonnaruwa. Its history dates back to fourteenth century and contributed to safeguard the sovereignty of the island, until it was lost in 1815. The rivalry in Europe and America of the Western nations had spilled over to the Indian Ocean. The Netherlands was overrun by the forces of the French Revolution. Consequently, this lead to the handing over of Ceylon by Dutch to the British. Likewise, the Portuguese, Dutch and British waged war against the Kandyan kingdom. In 1815, according to the Kandyan Convention, the Sinhala chiefs signed over the Kandyan kingdom to George III of Great Britain. The independence was gone with the wind. The British disillusioned the feudal chiefs. Although the feudal chiefs thought the British would co-operate as the Nayakkars and the actual power will lie among themselves. The chief Kappetipola led a revolt in 1818, which was easily crushed by the British. Puran Appu, Gongalegoda Banda and others led the rebellion of 1848. They were more easily crushed. Both British and Ceylon was effected by the seminal era of economic change and reforms, which brought forth a world of the 20th century. The Colebrook - Cameron reforms (1831-1832) laid foundations for the eventual emergence of centralised administration and an independent judiciary. Kandy has the reputation of being the home of the Sacred Tooth Relic preserved in the Dalada Maligawa. The Tooth relic is the Crest Gem of the Buddhist world. The traditional annual Esala Perahara or the Grand Pageant is an attraction to thousands of visitors from all over the world. The palace of the last king, Sri Wickrama Rajasingha (1798-1815) and the Audience Hall constructed in 1784 with richly carved columns of wood can be considered as the living examples of the Kandyan craftsmanship. The historic event of the signing of the Kandyan Convention in 1815 took place in this Audience Hall. The temple pictorial art. The Lake in the heart of the city creates a picturesque atmosphere to visitors. The natural forest reserve Udawattakale is rich with rare species of plants and animals. Buddhism, Sinhalese, Hinduism and Islam severely discriminated by the British. Education was entirely based on English medium and schools were run by Christian missionaries. Motto of the of the British was 'Buddhism will die out in few years time'. The mighty heroes came to the front, to boost us with the spirit of independence. Pioneers were foreigners including Colonel Henry Olcott and Madam Blavatsky, Anagarika Dharmapala. The scholars, Ananda Coomaraswamy and Hindu leader Arumuga Navalar, Rich Buddhist Hevawitharanes, Senanayakes, Wijewardenes, Amarasuriyas, Rajapakses, Pedrises and the scholar knight Sir D. B. Jayathilake joined the independence movement. From Sangha, Hikkaduwe Sri Sumangala, Migettuwatte Gunananda, Waskaduwe Subhuthi and Ratmalane Dhammaloka were the founders of the Buddhist Theosophical Society. At once due to the tragic event of series in 1915 Muslim, Sinhalese and Tamil were reunited to demand for independence. Followed by the restored unity there was born the Ceylon National Congress. The main founders were brothers Ramanathan and Arunachalam, Sir James Peiris, Macan Markars, Caders and Razeek Fareed, the Coreas, Jayawardenes, E. W. Perera and A. E. Goonesinghe. In 1931 Universal Franchise put Sri Lanka ahead of Britain itself in that regard, and the experiment of government by executive committees of the legislature was an earnest of a future full autonomy. Just after the World War II Mahatma Ghandhi's Sathyagraha movement helped to gain independence to India, which had a tremendous impact to speed all the endeavours to reach our goal; which was regaining of independence from the British rule in 1948. By a process of peaceful constitutional evolution, Sri Lanka won back her independence in 1948 and is now a soverign republic, with membership in the United Nations Organization, the Commonwealth and several other international bodies.